Dec. 28 Hoober auction at Chambersburg hopes to raise more than $8,000 from a Scout utility vehicle for local charities. Hoober, Inc., will be auctioning off a new Case IH Scout utility vehicle to benefit two area charities this coming Wednesday during the equipment auction at its Chambersburg location. Two area organizations, the United Way of Franklin County and Mennonite Disaster Services, will each receive 50% of the proceeds from the sale of the Scout. "We wanted to do something to give back to our local community. The auction gave us the perfect opportunity to do just that," says Mark Bonson, Chambersburg store manager. "We approached Case IH about joining us in this benefit, and they generously agreed to partner with us to make sure all the Scout sale proceeds could go to the United Way and Mennonite Disaster Services." 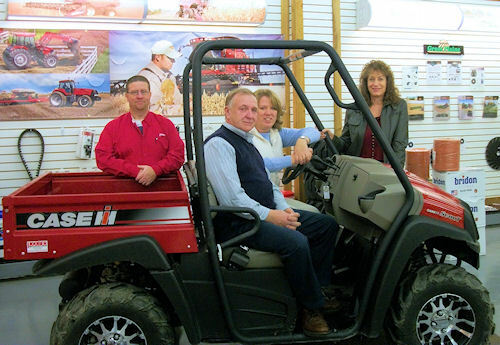 Bonson hopes the auction of the 14-horsepower Scout utility vehicle will raise over $8,000. The portion received by United Way will benefit the Women in Need Shelter for abused women and children in Franklin County. The remaining 50% will be directed to the Cumberland Valley Unit of the Mennonite Disaster Services, which serves a majority of counties in south central Pennsylvania. The Scout UTV benefit will be held during the company's equipment auction that gets underway at 9:30 a.m., Wednesday, Dec. 28 at Hoober's Chambersburg location at 975 South Main Street, Chambersburg, Pa. The auction is expected to continue until 4:30 PM. The auction will feature a variety of farm equipment, including tractors, combines, balers and more, as well as attachments, tools, trucks and other vehicles. "Hopefully, a big group of enthusiastic bidders will enable us to reach our target for the Scout because being able to help out two worthwhile organizations, especially around this time of year, will mean a lot." Financing is available. For more information on the auction, visit www.hoober.com to access the auction brochure. Or call (800) 447-6830 or (717) 264-3533.